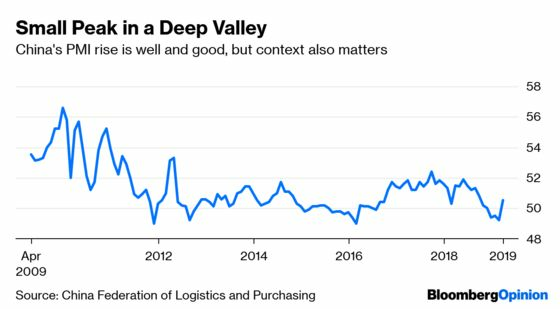 (Bloomberg Opinion) -- China's economy has come up for air, just a little. A bit of pep in recent Chinese numbers is encouraging. At least as important as the short-term bounce, though, is the long-term trajectory. The Middle Kingdom may lose its exceptionalism and start looking more like the U.S. and Europe in ways that seemed barely conceivable during the 1990s and the first decade of this century, when China mania was in full bloom. Much helium has been expended on projections that China's gross domestic product will surpass the U.S.'s sometime in the coming decade; very little attention has been paid to what might happen after that. First, let's look at the recent boomlet. China slowed significantly into the end of last year. Since then, things have been looking better, albeit from a low base. The closely watched manufacturing purchasing managers’ index rose to 50.5 in March from 49.2 the previous month, crossing back into expansion territory. While this is the biggest increase since 2012, the current level still trails the 51-plus average over the past decade. A jump in consumer prices and firmer factory prices have added to the idea things are on the mend. This week, the International Monetary Fund trimmed its growth forecasts for the world and some major economies. China was an exception; it went up a smidge, to 6.3 percent from 6.2 percent. In fact, things are looking brighter, with the housing scene improving and the Shanghai composite index climbing almost a third so far this year. Part of the credit for that upswing goes to authorities' campaign of fiscal and monetary loosening. While a number of steps have been unveiled, they have been targeted and lack the open-slather character of previous cycles. Nevertheless, there is a limit to what policy can do when long-term forces shape a pronounced slackening. In a thoughtful note last week, Capital Economics posits that China will slow to growth of about 2 percent by 2030. This makes sense, given how sepia-tinged the double-digit expansions of the early 2000s look today. Even so, few forecasters are prepared to go there. As Neil Shearing, chief economist at Capital Economics explained to me, there's a tendency to assume the future will look like the recent past. Not always the best bet. Two percent might seem alarming on the face of it. It need not be a disaster, given the world has survived Japan's descent from the giddy heights that began in the early 90s, Capital Economics noted. Yet even as Japan's star began to fade, the U.S. was gearing up for a truly great decade in the 1990s. Even Europe was doing okay as it prepared for monetary union. By the early 2000s, China was booming. We almost didn't notice Japan's retreat. What concerns me now is there’s no obvious candidate for the next China, the force that will come along to reshape and buttress world commerce. Maybe that X factor will be China 2.0. Two percent isn't nothing, given it's from an ever-increasing base, one increasingly driven by consumer spending and technology. And never count out the U.S., or its capacity for re-invention. By all means, applaud signs of stability in China's economy this year. While you’re at it, try to figure out the next five or 10 years. Daniel Moss is a Bloomberg Opinion columnist covering Asian economies. Previously he was executive editor of Bloomberg News for global economics, and has led teams in Asia, Europe and North America.